Andy is a three-time National College Baseball Coach of the Year award winner who is one of only two Division I baseball coaches ever to win a national championship at multiple schools. He has coached at the Division I level for more than 25 seasons, leading three different programs to the College World Series. He was named the head coach at the University of Arizona in the summer of 2001 and has since reestablished the Wildcats as one of the nation’s premier programs, highlighted by the 2012 national championship. In Tucson, Andy has guided the Wildcats to NCAA regional appearances eight times, including two trips to the College World Series in Omaha, Nebraska. He came to Arizona from the University of Florida, where he coached for seven seasons from 1996 through 2001. He led the Gators to Southeastern Conference titles and trips to the College World Series in 1996 and 1998. Previously, Andy spent six seasons at Pepperdine University, where he won a national championship in his first-ever trip to Omaha in 1992. His career began at Cal State Dominguez Hills in 1983 and he led the Toros to the Division II College World Series in 1987. 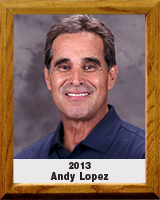 Andy played two seasons at Los Angeles Harbor Community College before he transferred to become a team Captain and starting shortstop at UCLA, where he earned a degree in 1975.